I have two Spectravideo SVI-738 computers. One in mint condition for my collection and one for daily use. The SVI-738 is perfectly suited to be modified as it has plenty of room in the case for modifications and there are also many instructions available to do various mods. 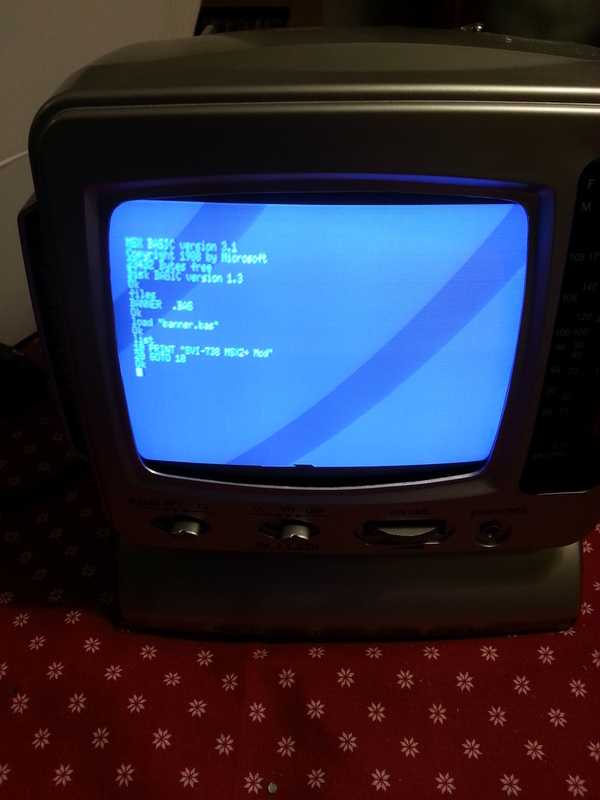 It is originally a plain MSX computer but it comes with the V9938 videochip available in MSX2. 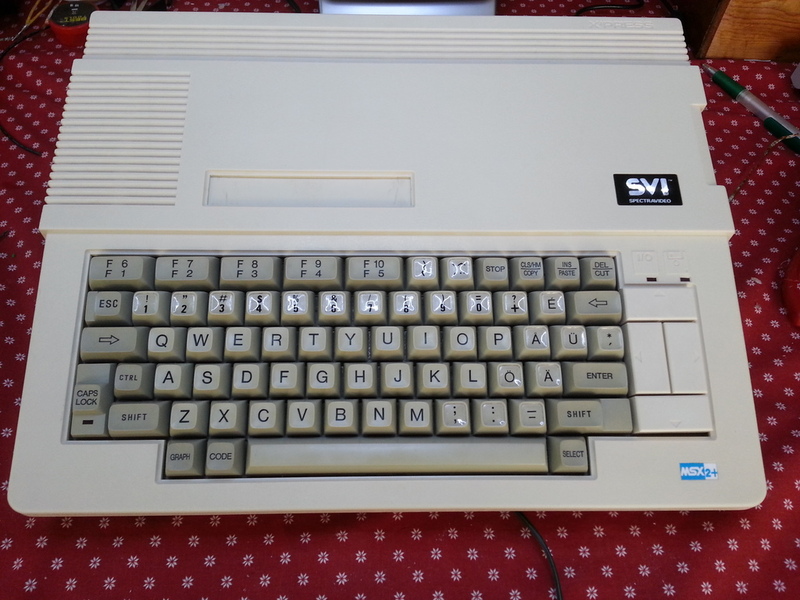 It is therefore often referred to be a MSX1.5. I planned to upgrade it to a real MSX2, by exchanging the original 16K VRAM to 128k and replacing the ROM-files with MSX2 ROMs. 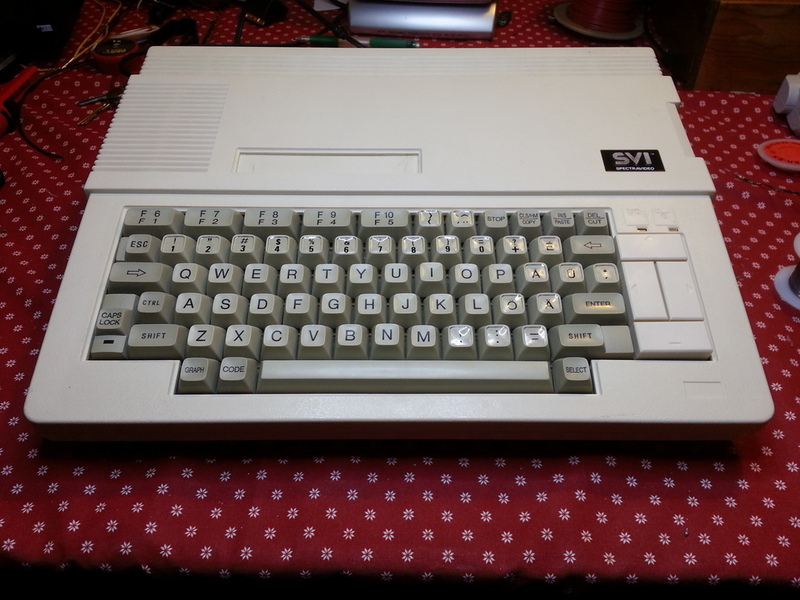 But then I found out that Nyyrikki had managed to do a MSX2+ of his SVI-738 (Home made weird MSX2+) so I decided to contact him and ask how he had done the conversion. He kindly offered his help and the modification described here is done using his instructions. Exchanged the internal 360k drive with a new PC drive to be able to use 720k disks. Exchanged the very stiff and easily breakable flat cable between the keyboard and the motherboard. 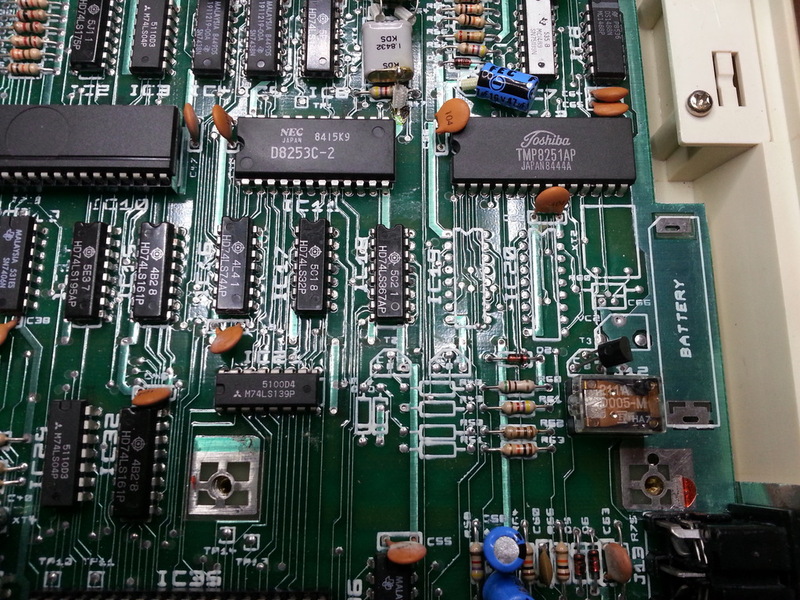 The VRAM on the motherboard is easily exchanged by desoldering the four TMS4416 (IC22-25) and soldering back IC-sockets and adding two 0.1uF capacitors (C17 and C18) in front of the IC sockets. 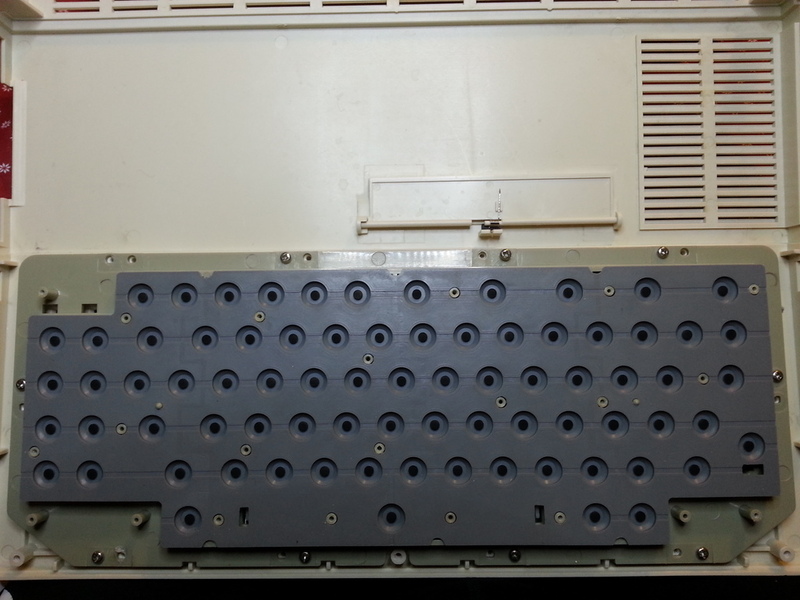 Then place the four TMS4464 circuits in the IC sockets. Start the computer after the VRAM is in place and check that the computer starts normally. 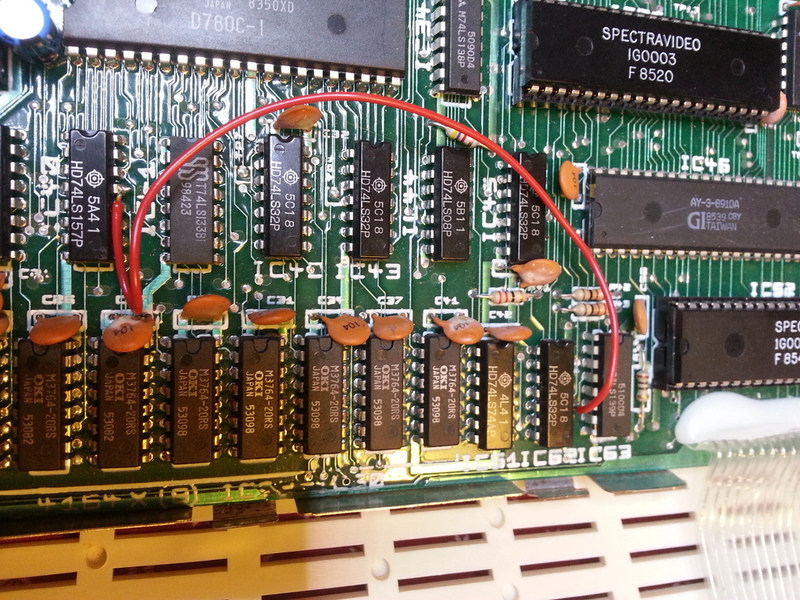 This is the more tricky part, not only do we need to desolder IC49 (RS-232 ROM) and put a socket in place, but as the new ROMs are of different size and with different contents than the original ROMs we need to do some additional modifications.Some address lines missing; A13 and A14 which need to be connected on the EXT/RS232-ROM (previously just RS232-ROM). 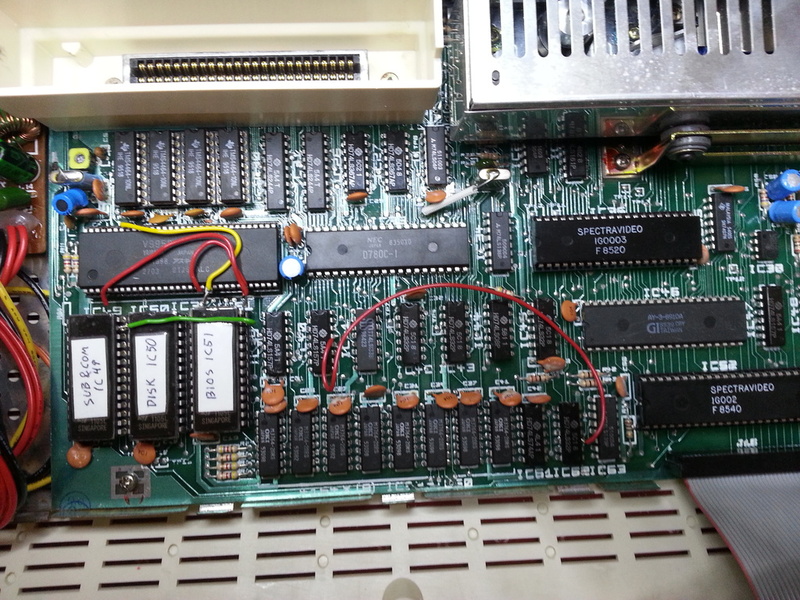 The original ROM was 8k (IC49 2764), but the new ROM is 32K (27256). 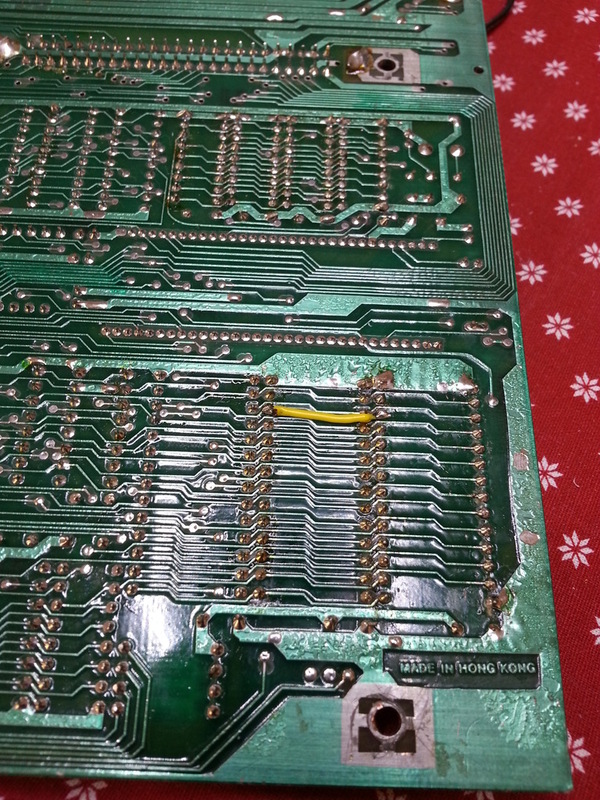 I chose to connect the A13 line on the underside of the PCB to A13 on IC50. The A14 line was connected to A14 on the Main ROM (IC51). 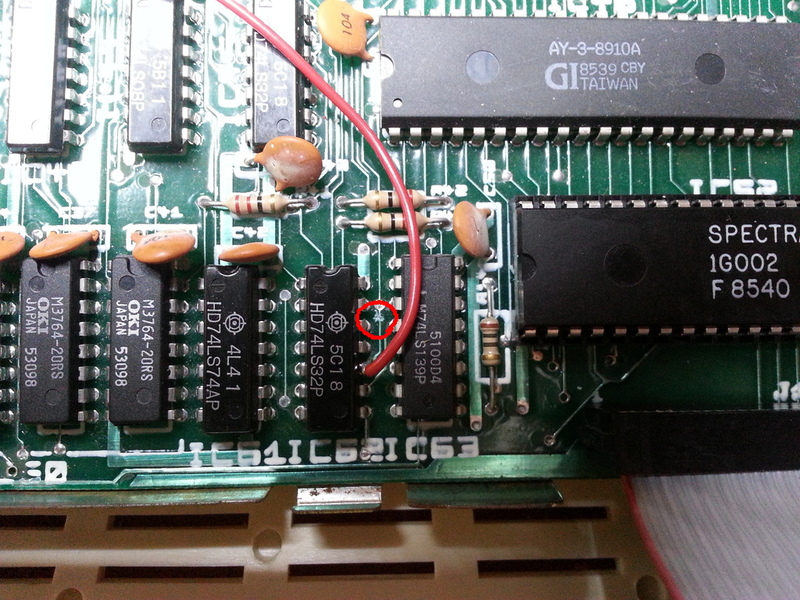 The disk ROM (IC50) was originally a 16K 27128, but the ROM I used was a 27256. 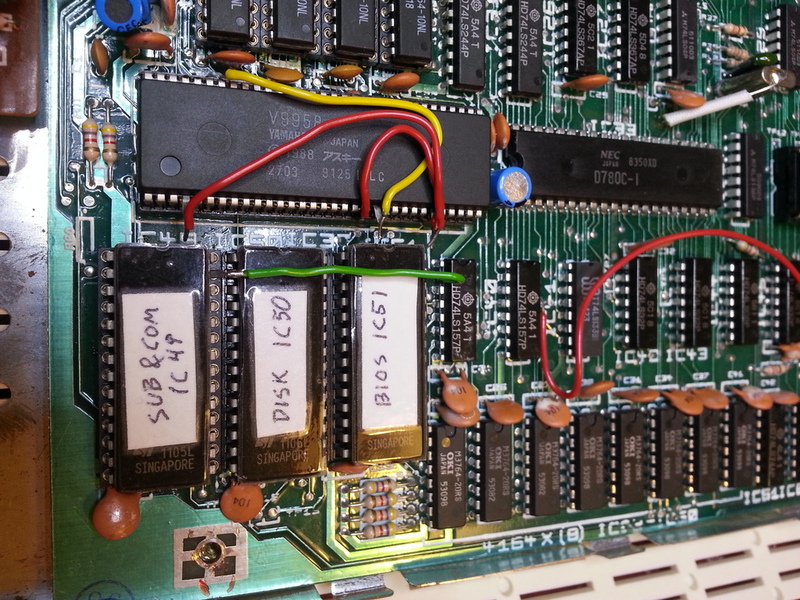 The A14 line on the 27256 controls which half of the 27256 ROM is used (when only using 16k) and it is originally connected to VCC on the motherboard. The Disk ROM needs therefore be placed on the upper half of the ROM or alternatively on both the upper and lower half to make it work with both high and low signal on A14. Start the computer when everything is soldered and in place and test that it starts up correctly. The V9958 chip must be prepared before it is connected to the IC37 socket. Pins 4, 21 and 27 are bent upward. Then connect pins 4, 20 and 27 together with a wire that are soldered to the pins. These are connected to ground through pin 20. Solder also a wire between pins 21 and 58. 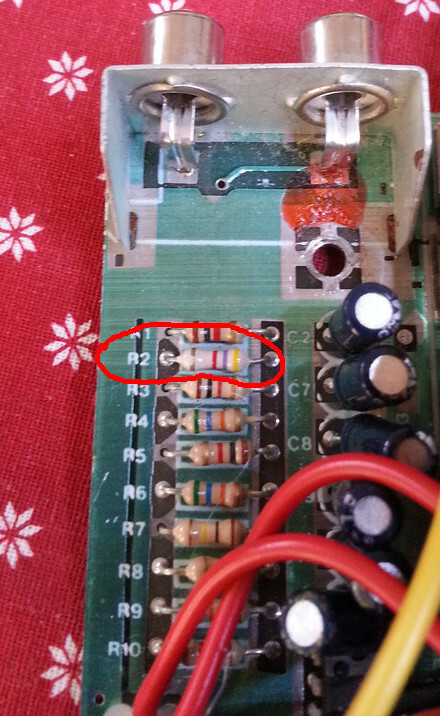 This connects pin 21 to 5V. 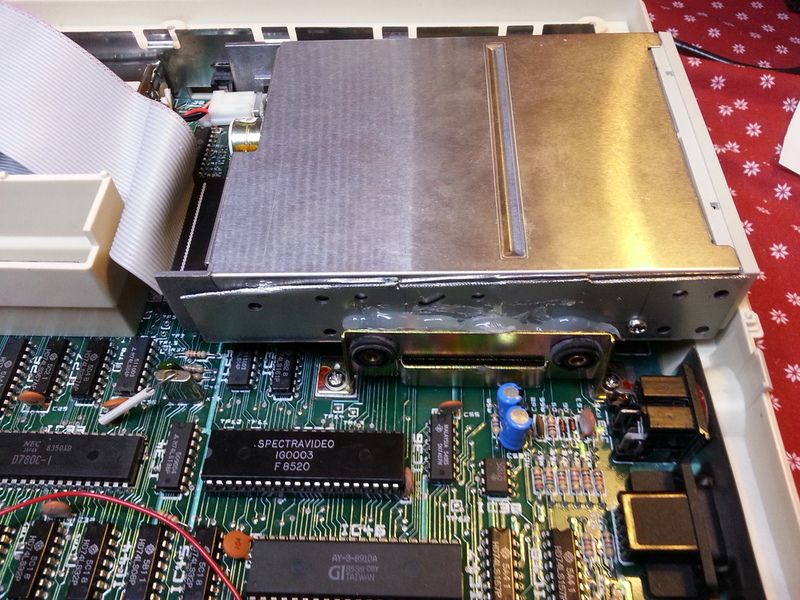 I found a PC TEAC floppy drive in my stuff that had a jumper for setting DS0/DS1. I changed the jumper to DS0. 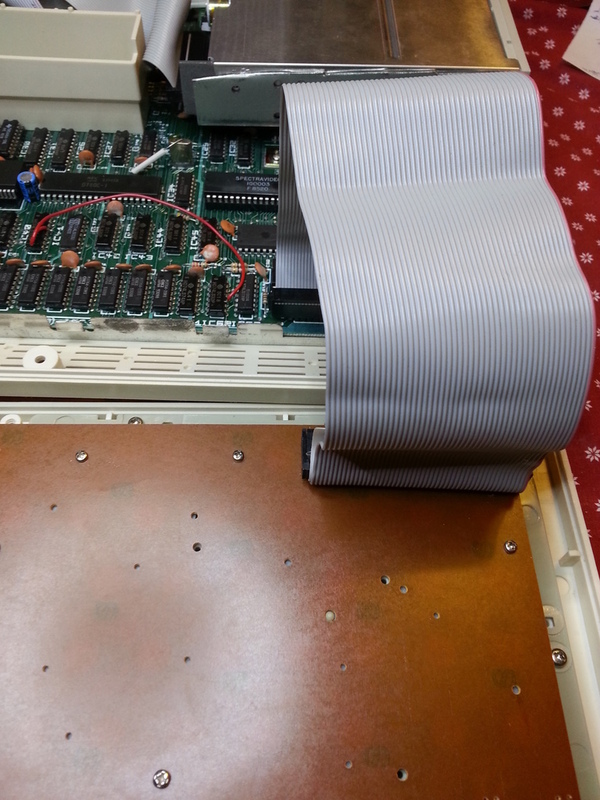 The floppy cable in the SVI-738 is very short and pin 1 on the new floppy drive was on the wrong side so I needed to exchange the cable to a longer one. 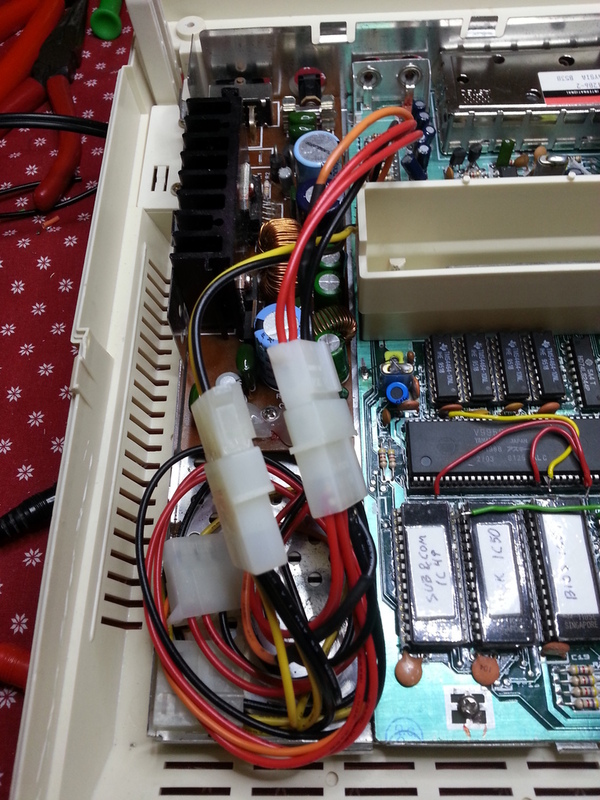 I used a normal PC-floppy cable, but connected the drive using the B-drive connector, thus avoid using the twisted part of the cable that cannot be used with the SVI-738. 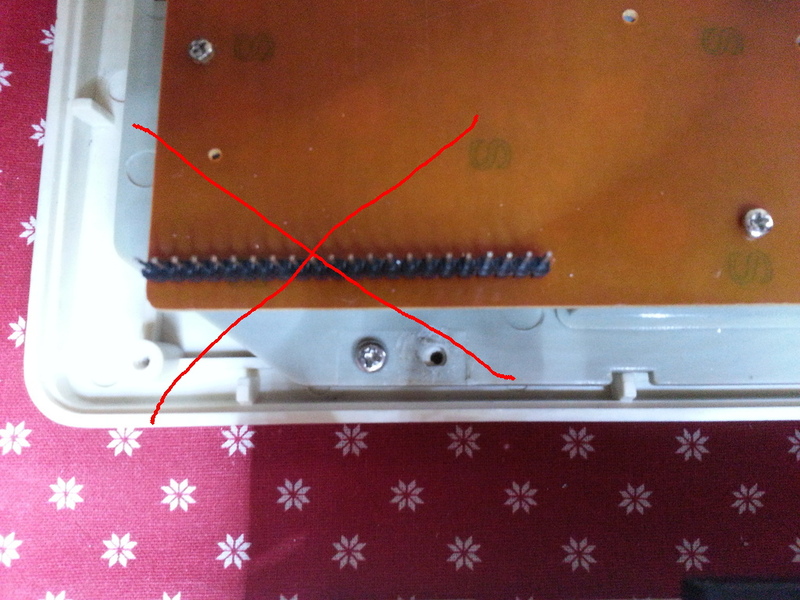 An inconvinient thing with the original floppy drive is that the screw holes are not in the standard locations. I mounted the floppy on a frame from a PC that I cut and tried to drill holes at the correct locations, but I did not manage to do it properly. So what to do? Yes, hot glue to the rescue! It works, but I do not think that it will hold the floppy in place for very long. I plan to take two steel plates and drill holes in the right locations and mount them between the floppy and the stands. 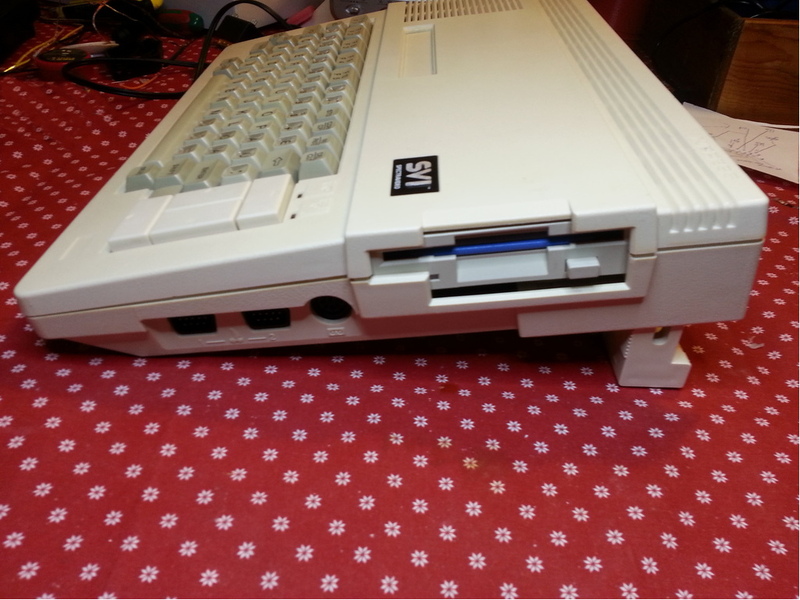 The original floppy drive was a little bit higher so there is a gap in the case now, but it looks ok anyway. The cable between the keyboard and the motherboard is known to break easily and it cannot be disconnected either. I wanted to have the possibility to disconnect the keyboard when working with the motherboard so I replaced the cable with a 50-pin SCSI cable. I desoldered the old cable and soldered a straight male 22-pin header on the motherboard. 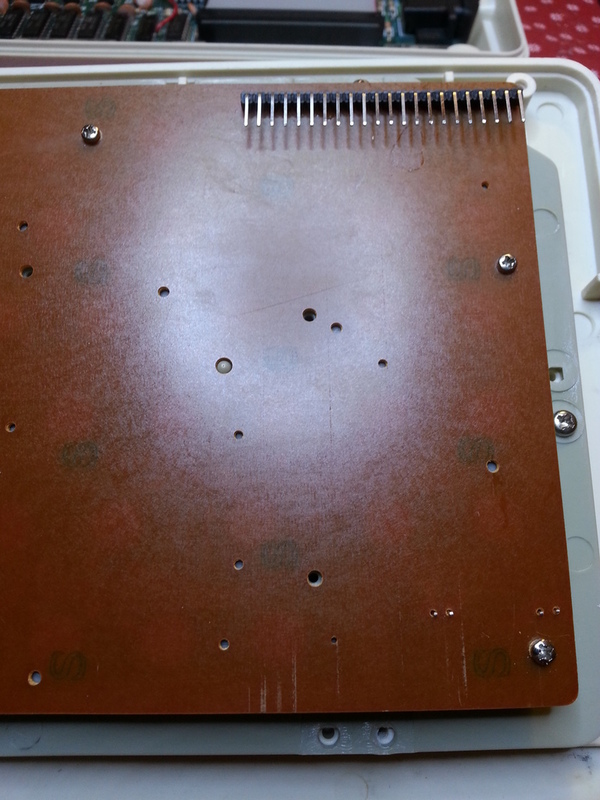 Then I soldered a similar on the keyboard PCB. Don't do this! The problem is that it makes it impossible to close the case. Use instead a 90 degree angled connector. As I was exchanging the keyboard cable, I decided to also exchange the power supply cables. I use two PC power T-connectors that I had. I wanted to use the correct color coding so I switched some of the wires. Now everything is connected and the computer is ready to be run for a final test. First off is to add a Real Time Clock-circuit to the motherboard. 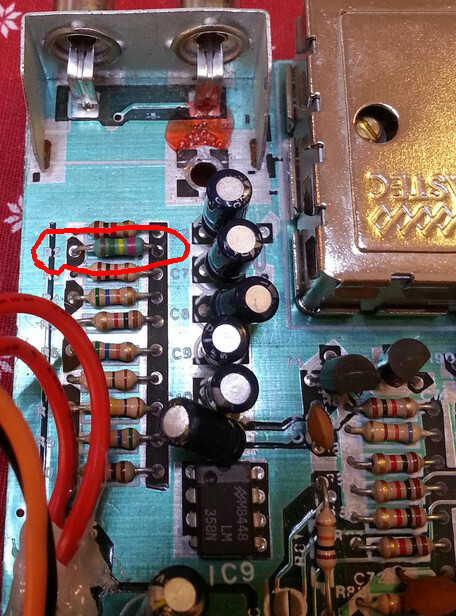 My SVI-738 is of the older model so it has already a part of the PCB dedicated to a RTC. ... and then I would also like to add an internal memory mapper. Unfortunately I have not found any instructions how to construct one, especially for the SVI-738. All credits for this mod goes to Nyyrikki. Thank you very much for all your help and your patience answering my questions!